Adobe’s announcement last year that it was working on bringing Photoshop to the iPad came as a surprise. Photoshop is the desktop standard of professional photo editing, a powerful program that would seem to demand the specs of a full-size computer. Due to both interface and power restrictions, mobile photography apps have always lagged behind their desktop counterparts. Even Adobe Lightroom CC, the controversial redesign that brought a unified version of Lightroom to both desktop and mobile devices, now has more features on the Mac and Windows versions than on iOS and Android. That a full version Photoshop could run on the iPad seemed almost too good to be true. But is it? Modern mobile devices are closer than ever to desktop computers in terms of performance. Digital Trends’ Julian Chokkattu called the 2018 iPad Pro “the most versatile computer you can own,” a testament to its desktop-like performance in a portable form factor. While the iPad Pro gets high marks for versatility, is it really fast enough to hold up to the demands of editing high-resolution, multi-layer Photoshop files? Obviously, we can’t answer really this question until Photoshop pops up in the App Store, but there are plenty of great photo editing apps already optimized for iPad that offer hints at its potential. 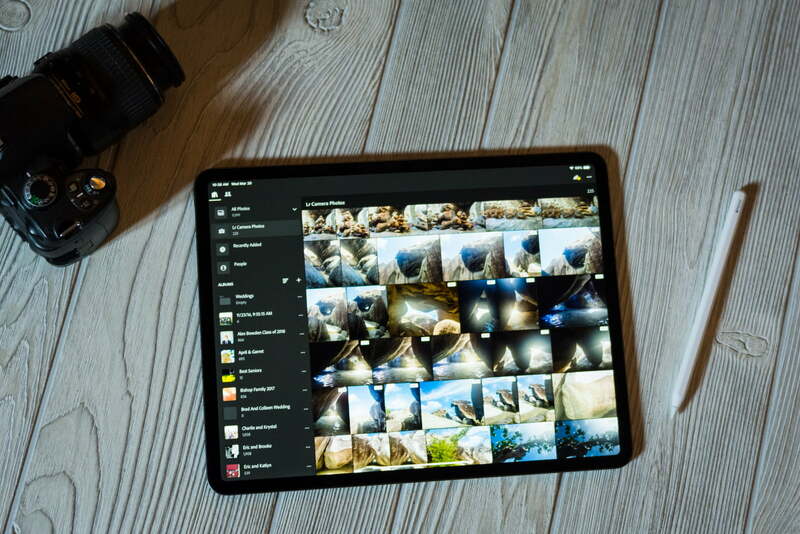 Using apps like Lightroom CC, we looked at just how prepared the iPad Pro is for major photo editing tasks, and whether or not it can replace a desktop system for serious photography work. Paired with accessories like the Apple Pen and Smart Keyboard, the iPad Pro feels more like a mix between tablet and laptop than an oversized smartphone. The Pen sits magnetically on the edge of the iPad, automatically connecting and charging, and flipping up the keyboard automatically eliminates the on-screen version. But the thin bezels of the iPad Pro — just 0.23 inches — mean a lack of ports in the name of portability. In fact, there’s just one, the USB-C port. 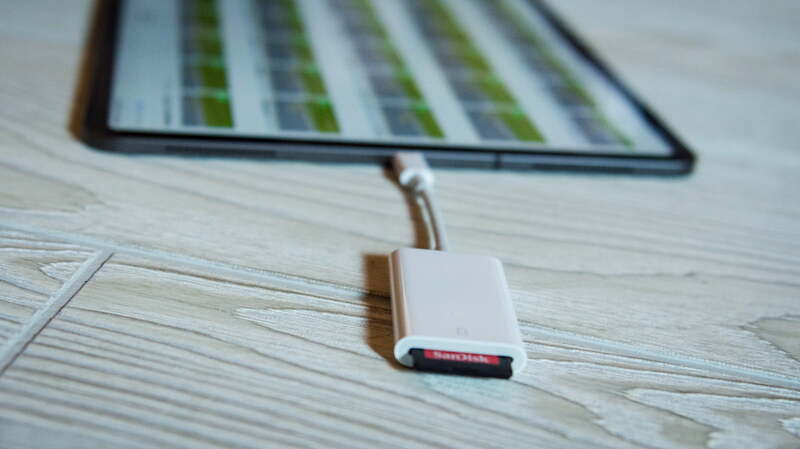 To import images, you’ll need an SD card reader dongle — which, if we’re keeping score, is no different from the latest MacBook Pros, which no longer have built-in SD card slots. Images can also be imported directly from a camera if the camera has a USB-C or mini-USB port. iOS doesn’t directly support external storage, so all images will need to be imported to the iPad’s internal storage. Cloud storage is one of the few options for stashing larger photo libraries. While the iPad Pro comes in sizes up to 1 TB, working photographers know that will run out quickly. If you’re accustomed to working with large libraries and external hard drives, you’ll need to adjust to a new workflow to use the iPad as your primary editing tool. There are workarounds — some third-party apps can support external storage. There may be some adjustment to find Photoshop’s tools once it arrives on the iPad. The Gnarbox app, for example, can use a Gnarbox to connect any external hard drive and then access it wirelessly on the iPad. Photographers can transfer files to and from the iPad Pro and external drives this way, but it’s hardly as seamless as using external drives on a computer. With Adobe products, you can access photos through Creative Cloud. Lightroom CC will dynamically download images to the iPad, even full RAW files, as you open them. It keeps all of your files and edits in sync across devices via the cloud. And with iOS, you can easily store images on iCloud. With both services, you’ll need to pay to expand your storage. But the iPad is meant to be a mobile photo editor, and cloud storage won’t work in every location. You might plan to edit photos over a long flight, only to realize that you’d have to pay for airline Wi-Fi to actually access them. Lightroom CC does give the option to store selected albums locally, so you could at least load your current projects before getting on the plane — but you’ll have to remember to do that ahead of time. It’s not just the hardware that limits how you import images; it’s also the software. Currently, to get photos from an SD card to Lightroom CC, the images need to be imported to the Apple Photos app first, then from the camera roll into Lightroom. While it’s not a deal breaker, it’s an extra step for photographers that often spend too much time editing as it is. What the iPad Pro lacks in external storage and import options, it makes up for with the touchscreen interface. Photographers and digital artists have long been ditching their clunky computer mice for a more tactile experience with tools like Wacom’s pen displays. But with the iPad Pro, both the touch device and the computer are one and the same. The iPad Pro screen is what any previous MacBook user would expect, just touch-sensitive. The colors are crisp and sharp. The 12.9-inch versions uses a 2,732 x 2,048-pixel liquid retina display; the 11-inch, a 2,388 x 1,668 display. Local adjustments feel like simple sketching using the Apple Pencil. Tapping the screen to use the healing brush to eliminate distractions or acne feels more natural and faster than dragging a mouse around the screen. Using the brush tool, the touchscreen responds to pressure, making it possible to make smooth and natural adjustments without constantly adjusting the brush flow. 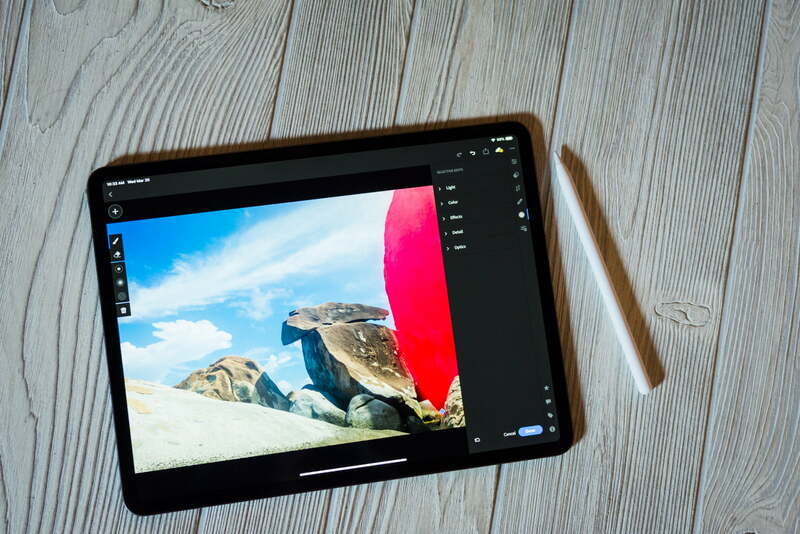 Touch devices and desktop computers aren’t meant to be used identically, so there may be some adjustment to find Photoshop’s tools once it arrives on the iPad. Lightroom CC, for example, has different shortcuts designed for a touchscreen without a menu bar at the top of the screen. Adobe says Photoshop will look different on the iPad when it arrives later this year. The toolbars will be smaller and context-aware, showing the tools most relevant to the task. Touch shortcuts, like pinch-to-zoom, will also be included. Is the iPad powerful enough for real photo editing? Tablets have traditionally lagged behind when it comes to processing power, which is why apps like Photoshop have remained bound to the desktop for so long. The iPad Pro changed this. Affinity Photo, a Photoshop competitor, already runs great on the iPad. Adobe has also demonstrated a 200-layer Photoshop file running on a beta version of the iPad app, zooming and panning around the canvas without any lag. We also found Lightroom to run very well, but it isn’t as intensive as Photoshop. The iPad Pro looks to be ready to handle the most demanding tasks, but not without a few quirks that make the editing a bit more cumbersome. Customers should always be aware that there could be some performance differences between the 1 TB iPad Pro — which we tested — and the smaller capacity models. The 1TB model gets 6GB of RAM, whereas the other versions have only 4GB. But without native support for external hard drives, that 1 TB model is likely what photographers will lean towards, if the $1,750 price isn’t too steep. The tablet will at least be an excellent companion to a photo editor’s toolkit alongside a laptop or desktop system. Using an iPad Pro as your sole editing machine will be tougher, but not for a lack of power. It can handle just about anything you can throw at it, and should have no trouble keeping up with Photoshop when it launches later this year. But there are other concerns. 1TB simply won’t be enough for avid photographers, and without native external storage support, customers will need either extensive cloud storage or a third-party workaround like the Gnarbox to make room for new photos. The 1 TB iPad Pro retails for $1,550 for the 11-inch or $1,750 for the 12.9-inch, with versions with less storage starting at $799. A 13-inch MacBook Pro with about half the storage sells for $2,000, but with a bit more RAM, more ports, and an OS that supports external storage. The iPad Pro looks to be ready to handle the most demanding tasks, but not without a few quirks that make the editing process a bit more cumbersome. The portability of a tablet compared to a laptop, however, may just be enough to offset that.